A special edition chess set celebrating this mementoes match. Still thought of as “THE” World Championship game all others are judged by. Reykjavik, Iceland 1972 sees at the height of the Cold War, the young brash American genius; Bobby Fischer, take on the dependable and seemingly unbeatable Russian, Boris Spassky for the World Chess Championship. After much drama, Fischer finally won the Championship. Spassky returned home to the USSR in disgrace as this was seen as much as a defeat of political ideology as the loss of a chess match! However, he continued to play on; winning the Soviet title again the following year. Fisher’s life was one of turmoil and culminated in his passing a few years ago almost destitute in the very place where his fame and fortune was won, in Reykjavik. 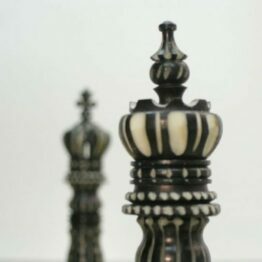 We offer this historic Staunton pattern, these are hand carved in Boxwood and Ebony as they were back in 1972 and by Jaques of course; and celebrate this match by embossing the King’s bases of the chess piece with the legend “Spassky vs Fischer, 1972 – Jaques London – Howard Staunton” and with a facsimile of Howard Staunton’ s signature in either gold or silver. 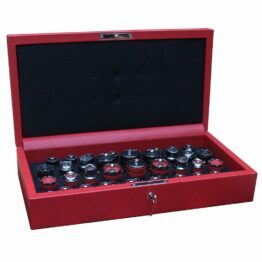 Extra Queens are provided as standard and the King size is 89 mm/ 3.5″. A pair of handsome leather book-boxes, a Geoffrey Parker classic design of the same period; is reproduced again with suede “pages” and gold embossing to each spine with the same legend as the King’s bases. 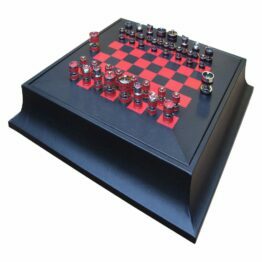 A matching inlaid leather chessboard finishes this collector’s piece. 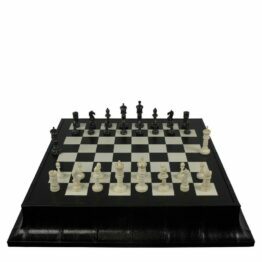 Who better to supply a world-famous chess match than Geoffrey Parker; the same set is still sold today under the name Spassky Fisher Chess Set. With a huge money prize on offer and Worldwide TV coverage, the match was compulsive viewing for millions who had only had a fleeting interest in Chess from their school days. We at Geoffrey Parker, already by that time recognised as the World’s finest makers of board games were requested by Jaques of London to make the cabinets and chessboards for the game. Jaques of London originally made the first Staunton Chessmen back in 1849 and would be supplying the pieces for all future major tournaments and Championships thereafter; they, therefore, got in touch with us to make the cabinets and chessboards required for the “Game of the Century” or “The Cold War Classic” as we like to call it.